For the Klimate Glove, premium feel, durability and value are top priority. Re-engineered to hold 200 grams insulation securely on the back-of-hand and fingers (where cold attacks), 100 grams on palm and with a new ultra-tacky and durable palm material, the Klimate Glove brings true Klim performance like never before. 100 Grams 3M™ Thinsulate™ insulation in palm. 200 Grams 3M™ Thinsulate™ insulation on top of hand and fingers. Upgraded palm material increases grip and durability. I purchased these gloves when I was expecting a long, cold and wet motorcycle ride. Seemed to work very well, admittedly I also had heated grips. I like the gauntlet type style that pulls over my coat sleeves protecting me from the cold and rain. Easy to get on and off. Great gloves for 30 to 40 degree weather, which is what I was looking for. If I had one complaint it would be that the fingers seem a little bit short. When reaching for that touchy one finger brake on my KTM it can be hard to get to. For a large glove it's a little small. It fits me a little snug and I sometimes wear a medium. I recommend them for anyone without huge hands and is not riding in weather down below freezing. I ride my bike year around in southern Utah. Our lows do get into the high 20s and low 30s. Have ridden my bike in these temps. I have a 25 min ride to work at freeway speeds for half of it. My hands are fairly chilled when I get to work but not frozen. I think these would be better with a inner glove. Quality appear good and they are long to go over your Jacket to keep the wind off your wrist. I just had hoped they would have been a little warmer. in the cold temps. I have used them for one season riding my bike twice a month during the winter. Might have ridden it more if these gloves were warmer. BEST ANSWER: i bought these for a 1,700 trip on the MABDR. Experienced light rain and cold temperatures a couple days on my trip. Kept my hands warm and dry, although I also have heated grips. I like the gauntlet style to fit over my jacket and keeps out the wind. Yes they are waterproof. They are not goretex so I don't know how many seasons they will stay that way. Very warm and very comfortable though. More like water resistant. If you’re out for an hour or two , they keep you dry. All day affair, no. 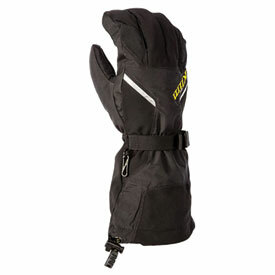 This glove does offer the full Gore-Tex performance and is waterproof.